Procrastinators can be both too hard and too easy on themselves. They can be their own worst critics – hating themselves for not getting things done. But they can also allow themselves to get away with the same excuses over and over again. Clicking on this article may be an act of procrastination for some people. 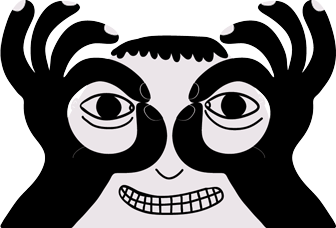 But it may also give you some strategies on how to break your usual patterns. Here are five tips. Break down your goal into smaller, more specific steps. You’ve been putting off setting up a system to back up your computer. When you do think about it, there’s so much to consider that you’re not even sure where to begin. So you don’t begin. But if you break down your big goal into smaller, specific steps, you will find it easier to make progress. If you are going to be backing up to an external hard drive and you don’t have one, you can start by figuring out how big an external hard drive you need. Then you can select a specific model and a place to make your purchase. Then you can figure out what backup software to use, whether you want to schedule backups automatically or manually, and so on. Instead of one big daunting project, you now have a series of smaller, more easily obtainable goals. Don’t wait until you are in the mood to get started. If you wait until you feel like starting your computer backup project, you may be waiting a long time. You may never feel like taking even the smaller steps outlined above. You may wish you were the kind of person who did not wait until their system crashes to think about backups. But the difference between you and the person who does his or her backups may have nothing to do with mood. That person may not have wanted to do it, either. But that person did not wait until the proper mood struck. Make a commitment in public. One way you might be able to get your project underway regardless of mood is to make a public commitment. Send out an email or a tweet. Put something on Facebook. Tonight, you’re starting the process of backing up your computer, and if you don’t, everyone will know. If that sounds a little too public to you, make your commitment with just one other person. Ideally that person will also have something they are struggling to get done. You can offer support and encouragement to each other. 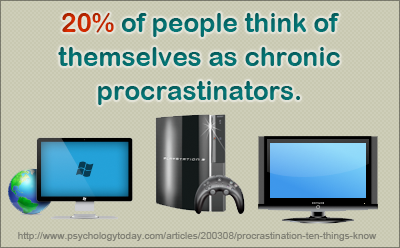 Many procrastinators are perfectionists. You’ve waited this long to back up your computer – you might as well do it perfectly. Imagine, if, after all this time, you picked out the wrong size external hard drive or selected software that you later learned was not as highly rated as an alternative. What would happen then? Most likely, you would still have achieved your goal of having a working backup. When you complete your goal of a backup system for your computer, don’t berate yourself for thinking it should not have taken so long or it could have been done better. Give yourself some positive reinforcement – you achieved your goal! You are allowed to start thinking of yourself as someone who has the ability to get things done.